This page as well as my basement is under�construction.� More pictures and text are coming.� Here is what I have for the moment.� This page will evolve on an almost weekly basis until all the pictures and text are finished.� The finished product will�be spread over several web pages so that each page is not too long for viewing via a dial-up connection.� There is considerable history here that I will be writing.� There are only but so many hours in a day and I work two jobs so progress in my shop and on this web site goes much slower than I would like. 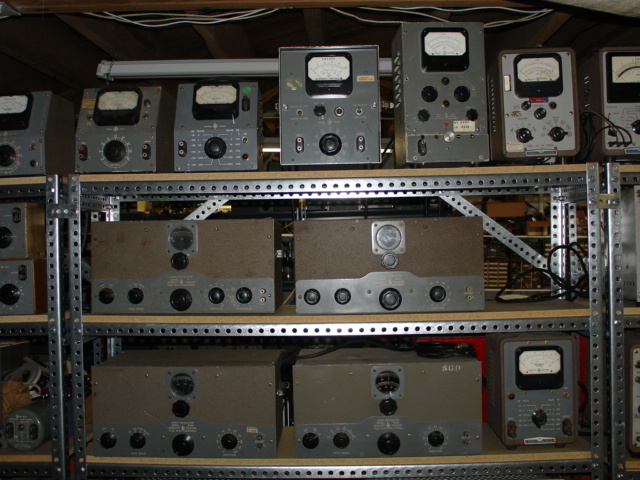 This is a view of my collection of vintage HP oscillators, meters and related equipment from the 1940s and 1950s.� This is the first phase of the museum to be mostly completed.� The rack was assembled during the week of Nov. 21, 2005.� Some adjustment of the location of some of the equipment will be done to improve the presentation.� The following pictures show closer views and lists�the equipment shown. 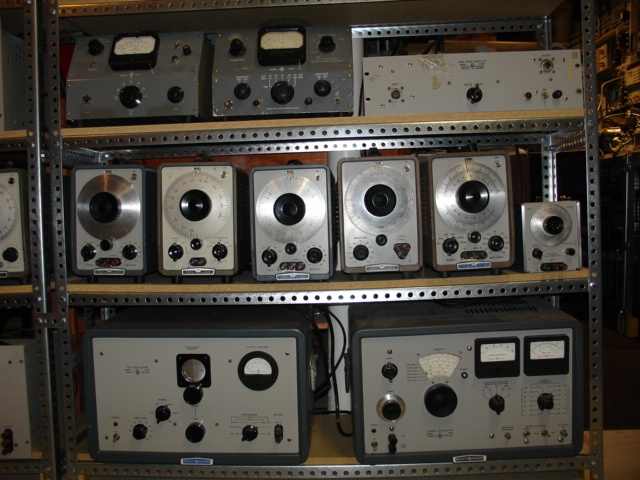 The upper left is an HP200A.� Next is an HP200BR (R for rack mount) and an HP400A AC Voltmeter.� The next row shows an early vintage HP200B with round corners and an HP200B with fine tuning control (this was unusual).� On the right are HP350A and HP350B attenuator sets.� The bottom row shows and HP200C, an HP200D, and bridging transformers for use with the oscillators and meters. 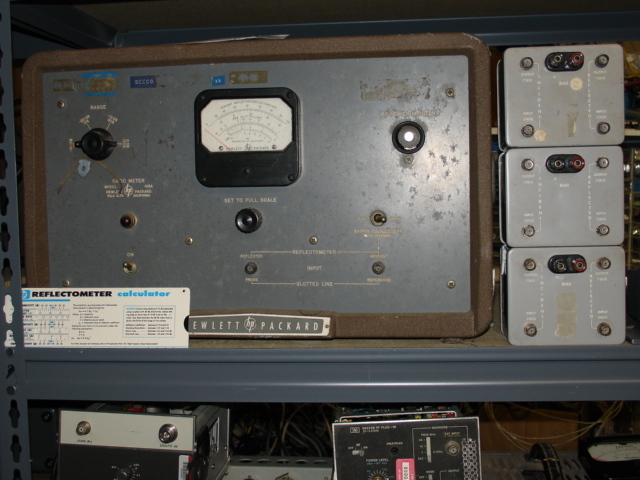 This is an early vintage HP320A distortion analyzer (it may be the oldest piece in the collection). 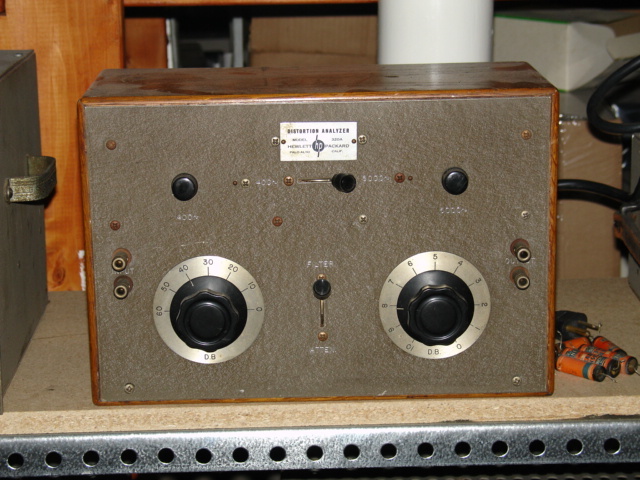 This unit was in pitiful shape when I acquired it and it took a lot of effort to restore it to like new condition.� I had to replace all the capacitors (shown on the right).� It works perfectly now. 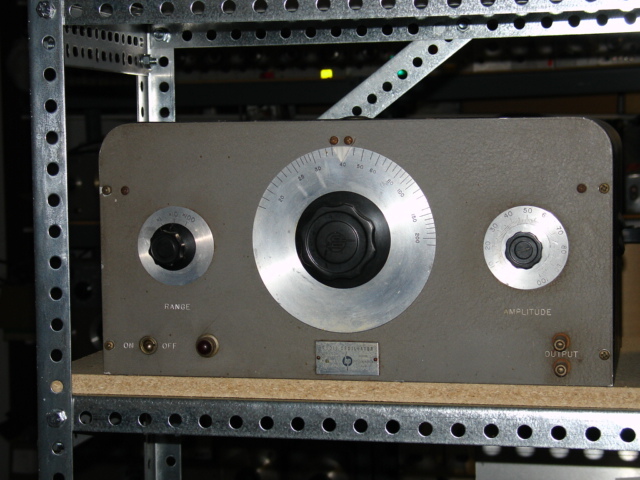 This unit has a very low serial number and was among the first of these built -- probably in 1940. 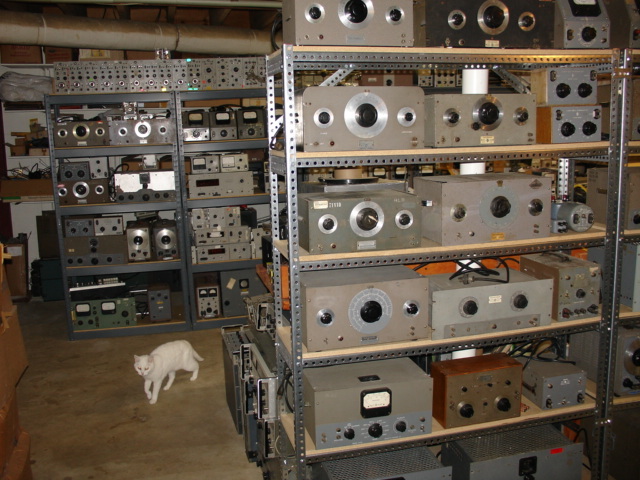 This view shows part of a second rack of equipment and Frisky. 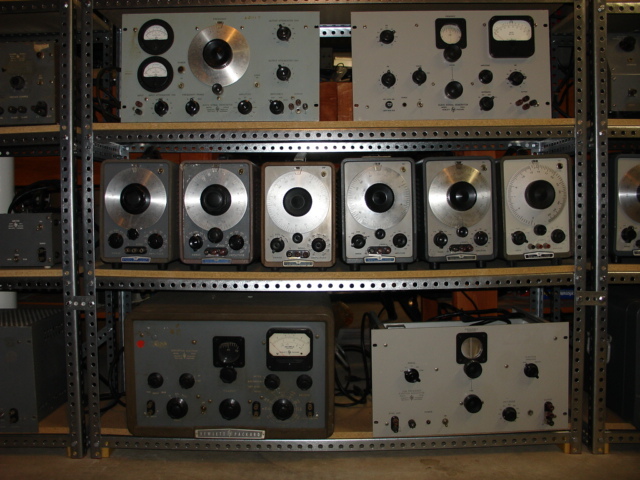 The equipment on the second rack is in mostly temporary positions for the time being just to be out of the way while other construction is taking place.� Some of the equipment was custom manufactured and does not have a standard HP catalog number. 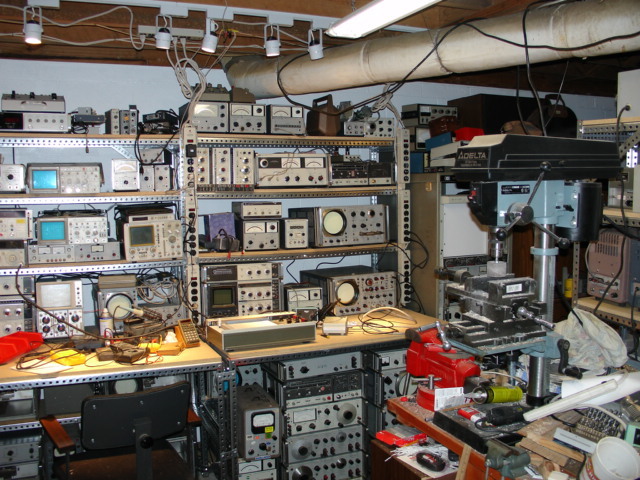 (temporary picture) This view shows the second rack and my very messy old main shop table in the rear.� The shop table�was replaced in late December 2005 by a rack like the first with the addition of table space.� The much expanded shelf system will hold the equipment I use in my work. See the new pictures below. 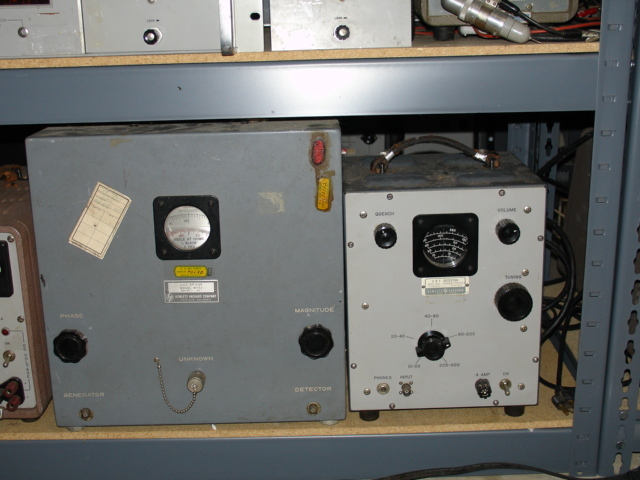 Here is an HP803A VHF Impedance Bridge and an HP417A Detector used to detect the null condition on the HP803A. 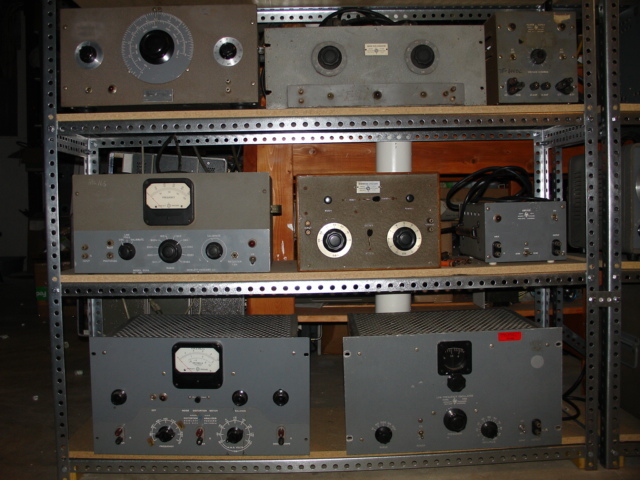 (temporary picture)� This view of the top of one of the second row racks shows various microwave accessories including an HP805C slotted line and a pair of HP475B tunable bolometer mounts.� A number of thermistor power detectors (HP477A and HP478A), HP423 crystal detectors, and other useful items can also be seen.� The large instrument one shelf down is an HP416A ratio detector which automated the measurement of SWR. 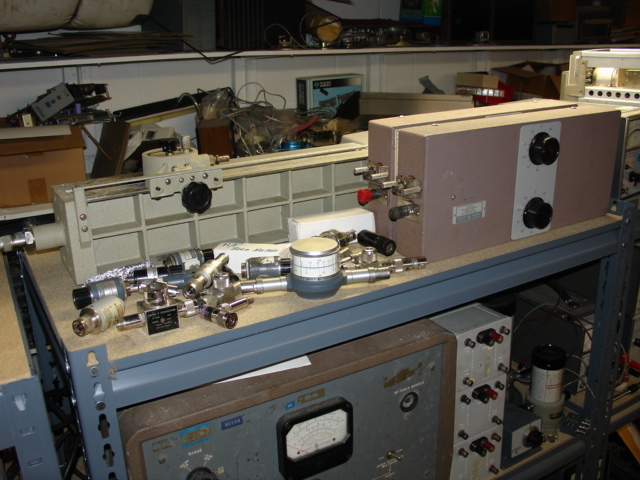 Here is a close up picture of the HP416a ratio detector and there is a reflectometer slide rule on the lower left. 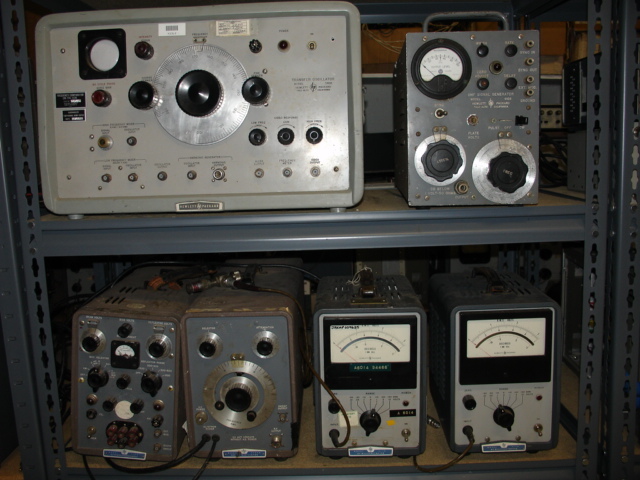 (temporary picture) The upper shelf shows an HP540A Transfer Oscillator used to accurately measure frequency up to about 12 GHz by a heterodyning the signal down to a lower frequency where direct measurement was possible.� On the right is a very rare HP610B UHF oscillator -- this was a sort of�predecessor to the better known HP612A.� The lower shelf shows an HP717A power supply (left) for use with the�HP670HM microwave sweep oscillator (right).� The HP670HM used a mechanical sweep.� On the right are two HP411A RF voltmeters.� The HP411A used a novel method to achieve accurate and linear RF voltage detection up to about 1 GHz by using a match set of diodes.� The signal detected from the main diode was used to servo the amplitude of a low frequency sine wave detected by the second diode such that the detected signals were exactly equal.� Then the easily measured amplitude of the low frequency signal was the same as the amplitude of the high frequency signal. 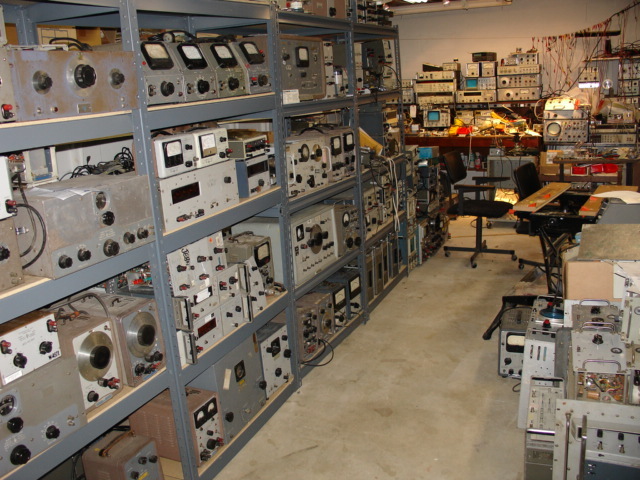 This is a picture of the new shop table and shelves.� The shop table is 12 feet long and is divided into three four foot sections.� The organization of equipment from left to right is generally along the lines of frequency spectrum -- lowest on the left and highest on the right.� There are 72 feet of shelves which holds quite a bit of equipment. 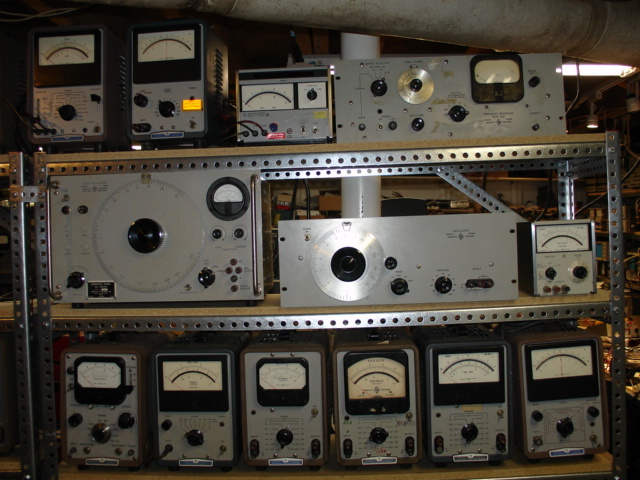 This is a view of the left side of the shop table which has low frequency equipment.� The middle table has medium to high frequency equipment. 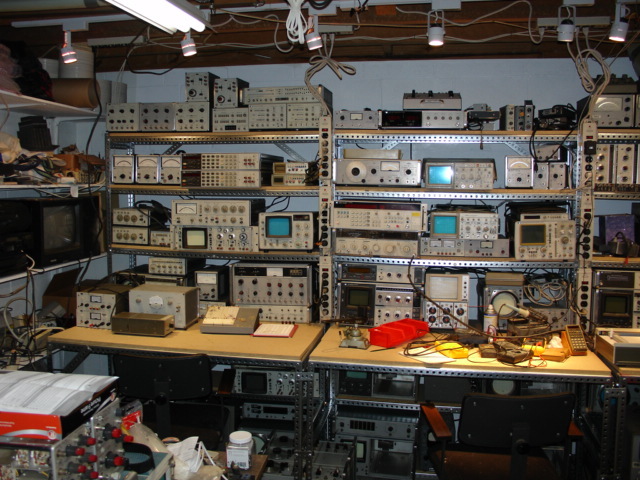 This is a view of the right side of the shop table showing mostly high frequency and microwave equipment.� An HP1415A time domain reflectometer is shown on the second shelf at the right edge of the table and an HP 18 GHz sampling scope is shown below. 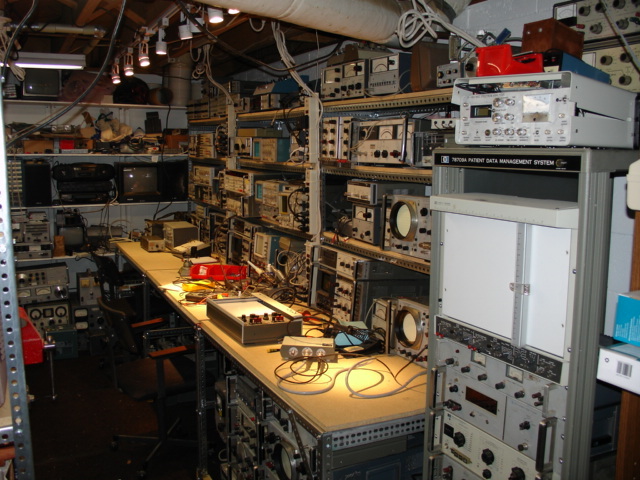 This is a view of the new shop table which has 24 square feet of table space.� The equipment here is used in my work.� Some of the equipment needs a little work to operate like new. 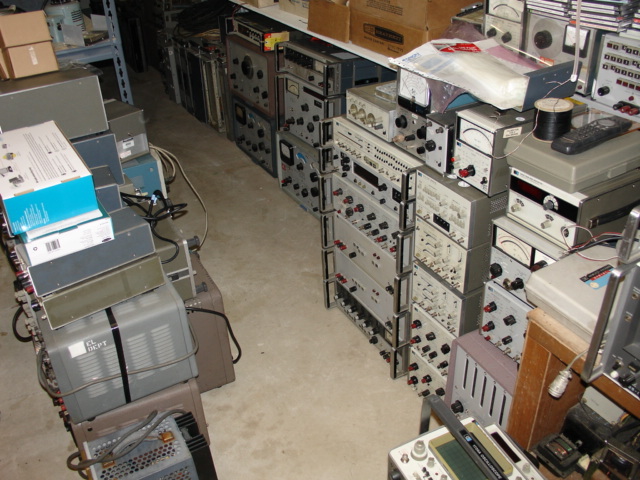 This is a view of end of the second rack closest to the shop table (to the right).� The scope on the table with the dark green filter is an HP130A -- the first scope HP sold.� The other scopes are a Tektronix 561A, 5103N mainframe, and 504 (lower rack mount unit). 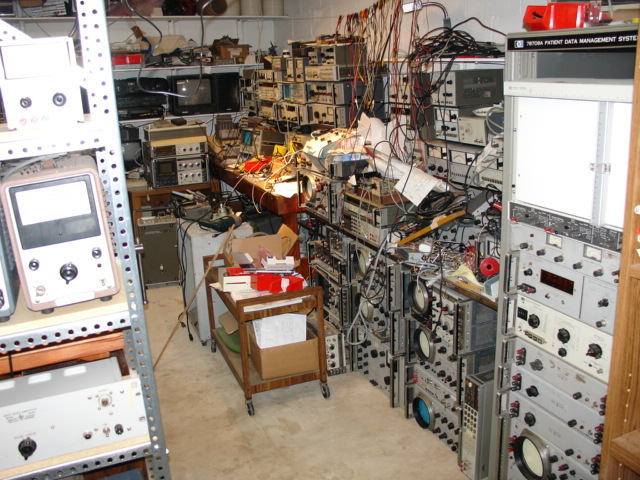 (temporary picture)� Here is a view down the back isle of the second rack showing various equipment stashed out of the way for the moment. 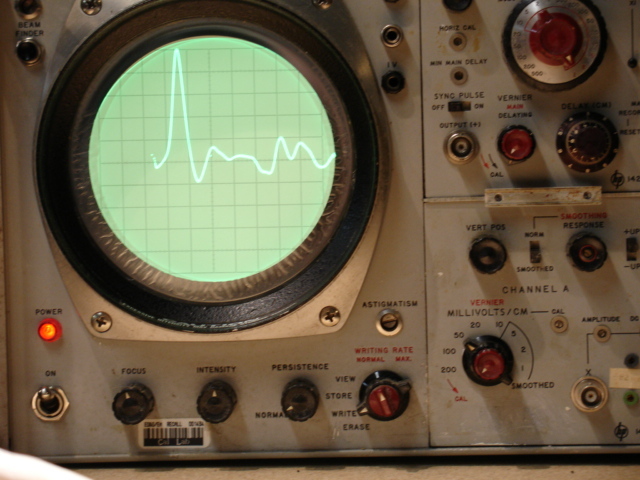 This is a view of my 18 GHz sampling scope showing a pulse with a base width of 200 picoseconds from my HP8406A comb generator.� The unit consists of an HP141A mainframe scope with HP1424A sampling sweep plug-in, HP1411A sampling vertical plug-in, and (not shown here but can be seen a few pictures up) HP1430C 18 picosecond external sampler.� The horizontal scale is 200 picoseconds per division. 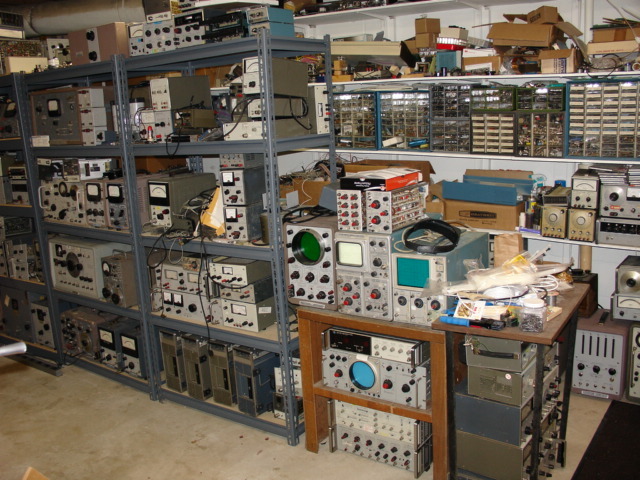 The following pictures are temporary and show the developing state of my shop. 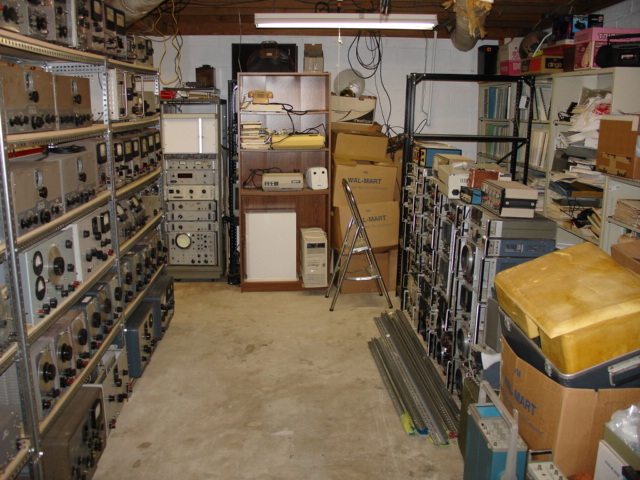 (temporary picture)� This view shows the first rack and other equipment stacked out of the way for the time being.� The bookshelves on the right house an extensive collection of HP manuals, application notes, and catalogs.� Eventually, an office desk will be where the WAL-MART boxes are and there will be much more floor space.� The angle iron by the oscilloscopes was used to construct a new shop table with 72 feet of shelving to more efficiently store and use the equipment.� See the pictures below. 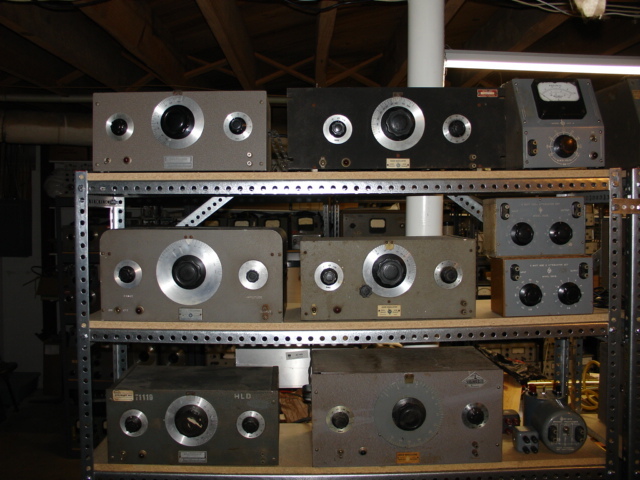 (temporary picture) This view shows the�old main shop table and a variety of HP equipment stored to be out of the way. 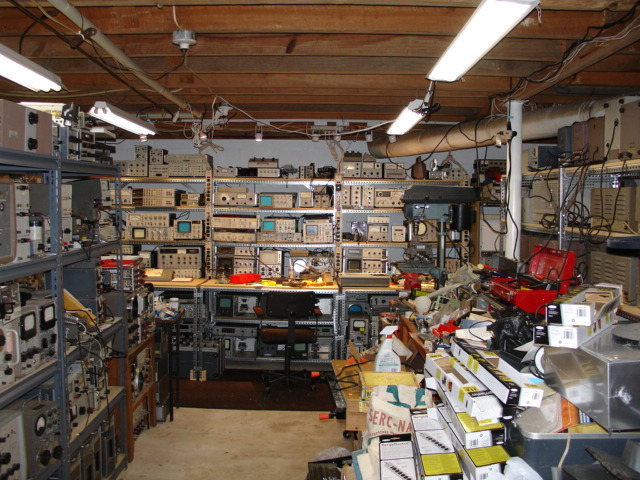 �This has been replaced with a rack and table system made of angle iron as shown in previous pictures to provide a lot more space.� Believe it or not, things are actually going to be very neat when I am finished and there will be lots of room to walk around. 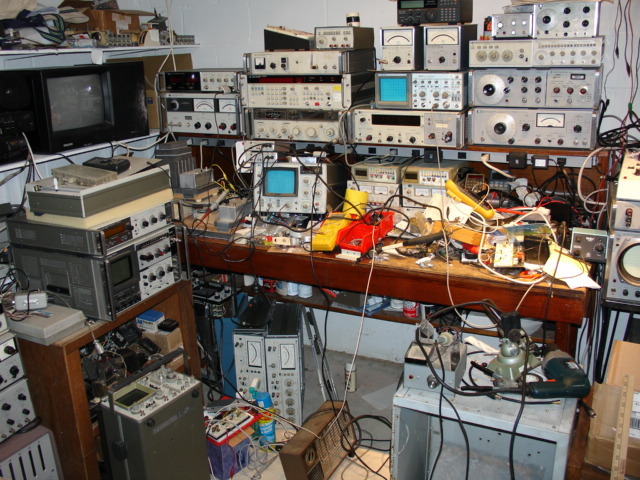 (temporary picture)� This is a close up view of my old main shop table.� You can see my 30 year old HP25 calculator that still works perfectly.� On the floor are an HP1726A 275 MHz oscilloscope and a pair of HP339A distortion analyzers -- one is a junk unit for parts and the other�is almost working like new.� You can also see�two of my HP spectrum analyzers -- and HP141T system and and HP3580A (blue screen on the table). 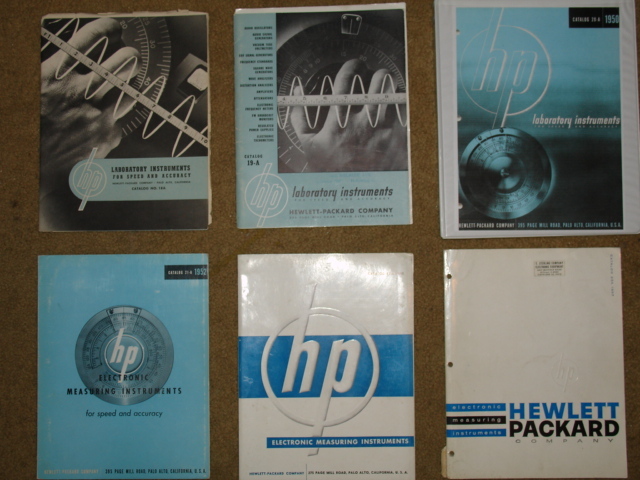 These are some of the very old HP catalogs in my collection.� These are all the major catalogs from 1945 to 1957.� The first one on the top left is from 1945.� The next one is the 1948 catalog followed by a photocopy of the 1950 catalog.� The next row shows catalogs for 1952, 1955, and 1957.� Except for condensed short form catalogs, there were no main catalogs in between these years.� It was not until 1967 that HP began publishing a new catalog every year (except for 1971 and 1974).� I am aware of only one older catalog than the 1945 -- it is either a 1941 or 1943 -- see the sub page I have on HP catalogs. 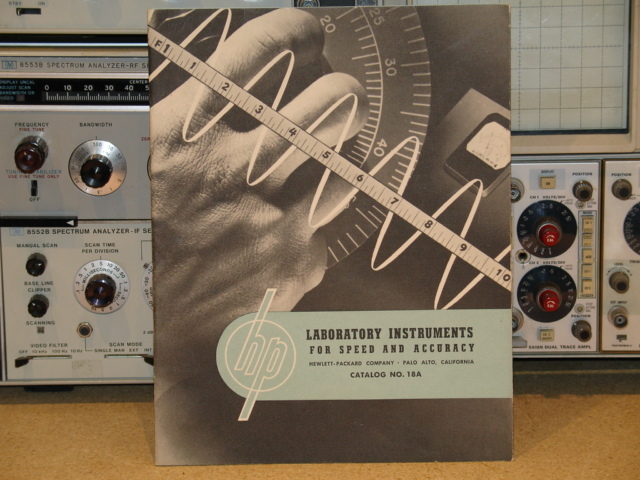 Here is a close up picture of the HP1945 catalog. 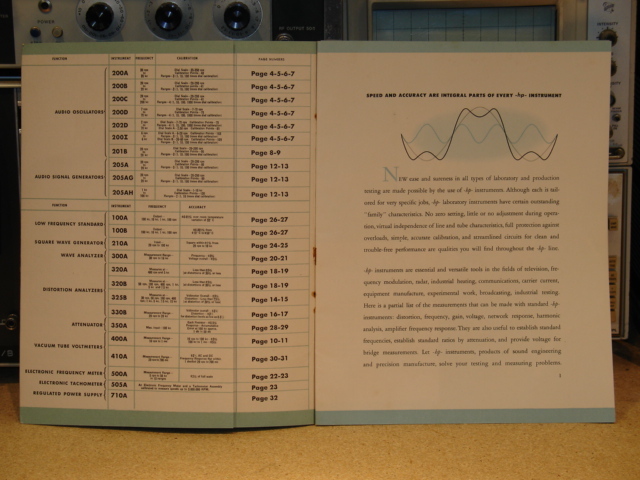 Here is the contents page of the HP1945 catalog. 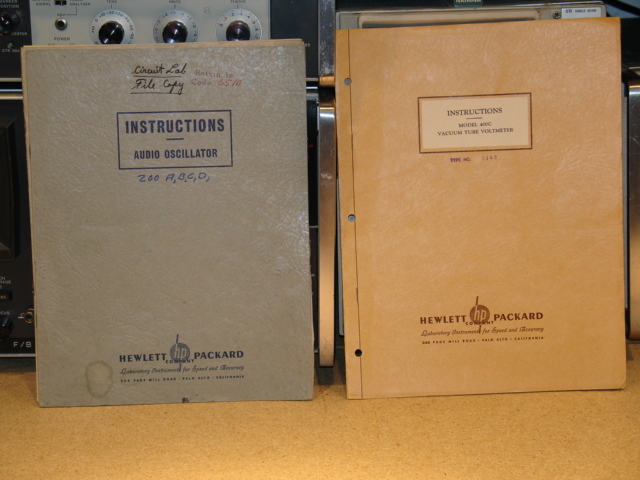 Here are two very old operation and service manuals in my collection.� The audio oscillator manual is from the very early 1940s and the HP400C manual is from the mid 1940s.� I have many hundreds of manuals -- these are very useful for history and in making repairs. 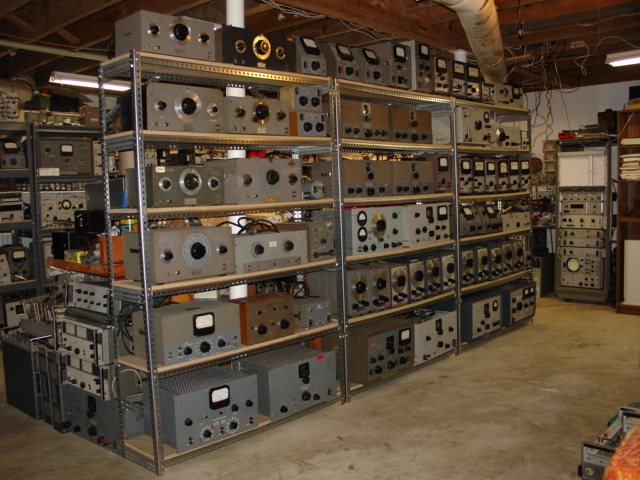 This is all I have to show for now.� There is still more HP equipment than what you can see in these pictures.� Much more is coming so stay tuned.� Once I attain better organization in the shop, I can then devote more time to writing for this web site. Email contact information� This link has the information to email me with questions, comments, etc.� I am always glad to hear from and respond�to people who like this site. http://www.kennethkuhn.com/hpmuseum This link takes you to the main HP Museum page. http://www.kennethkuhn.com This link takes you to the main page of my personal web site where you can access a variety of information.